This admittedly oddly named series is basically two scifi series in one. It begins with Ledo, a young second lieutenant in the Galactic Alliance, who has spent his entire life fighting the plant-like aliens Hideauze throughout the galaxy. After one of the most impressive space battles you’ll ever see animated, Ledo is accidently sent through a wormhole with his large (but not giant) piloted robot Chamber to a large, floating city on a planet covered in water. You get no points for figuring out this is Earth (albeit an one after an apocalyptic ice age and subsequent thaw). This isn’t a wacky fish-out-of-war-torn-water comedy; it has its moments of lightheartedness, but it’s a thoughtful attempt to make us appreciate the planet through the eyes of someone who has never experienced anything like it — although I’d be shocked if Ledo wasn’t called into battle again before the end of the series. Gargantia on the Verdurous Planet is currently streaming on Crunchyroll. Based on an extremely popular manga by Hajime Isayama, Attack on Titan takes the giant monster genre in a dark new direction. The Earth is under constant attack by humanoid giants called Titans who eat any human on sight, while the remnants of humanity live in a single city surrounded by three enormous concentric walls; this protects them for about a century, until an even bigger, meaner giant knocks the first wall down, killing the mother of our young protagonists Eren Yeager and his (adopted) sister Mikasa Ackerman. When the giants begin to break through the second wall, Eren discovers the ability to transform into a Titan himself — a power that not every human living in the last city on Earth is okay with. Think of Attack on Titan as Japan’s equivalent of The Walking Dead — a show where the giant monster attack never stops happening, and the stresses that puts on people and society. Let me assure you, Attack on Titan is not any cheerier than Walking Dead in that regard. So Satan is about to finally conquer hell when he’s confronted by the Heroine Emilia. This has the unexpected result of transporting them both (along with one of Satan’s minions, Alciel) to modern-day Tokyo, where they're trapped in the bodies of a teenagers, their magic doesn’t work and they have no way to make ends meet. And that’s how the Devil gets a part-time job at McDonalds (cleverly disguised as “MgRonalds,” yes, with a “g.” Nice save, Part-Timer!). Part-Timer is a lot like Invader Zim, in that a megalomaniacal being arrives on Earth, but whereas Zim actually had some resources and plans that occasionally worked, it’s all Satan can do to get an apartment, work his job, and figure out things like bank accounts. It's all played very straight, but if the idea of watching the devil try to work a McDonalds’ deep fryer doesn’t sound like something you want to watch, then.. I don’t even know. The Devil is a Part-Timer! is currently streaming at Funimation. Flowers of Evil is the most interesting anime of the spring season for several reasons. First, it’s storytelling is ponderously slow, but somehow incredibly tense. The first episode features a detached high school student named Takao who has a crush on a schoolmate named Nanako but chooses to lose himself in Baudelaire’s classic Flowers of Evil; eventually he’s publicly humiliated by another girl, and something inside Takao changes into something dark and menacing. That’s it. That's the whole first episode. The second thing that makes Flowers so different is that it's rotoscoped, meaning it was filmed in live-action and then drawn over, so not only it animated differently than most anime, it looks completely different too. It’s actually kind of ugly — many Japanese anime fans actually actively loathe it — but its ugliness is fascinating, and sets the series’ slow, somber tones perfectly. Flowers of Evil definitely isn’t going to be for everyone, but it’s almost certainly going to be the most famous (or infamous) anime of 2013. Flowers of Evil is currently streaming on Crunchyroll. Everybody says that Gundam is the Star Trek of Japan, but that's mainly because of the show’s popularity and the many incarnations its main universe has spawned over the years. But in all honesty, the 1970s anime Space Battleship Yamato is much, much more Trek-like. It’s about the aforementioned space battleship trekking across the galaxy for the alien technology that can save earth from destruction; of course, there are other aliens who are rather invested in Earth’s destruction, so things get pretty dicey along the way. The original Yamato anime was brought to America in the '70s as Star Blazers, and was one of the first cartoons to be shown here that had an overarching, continuing plot. 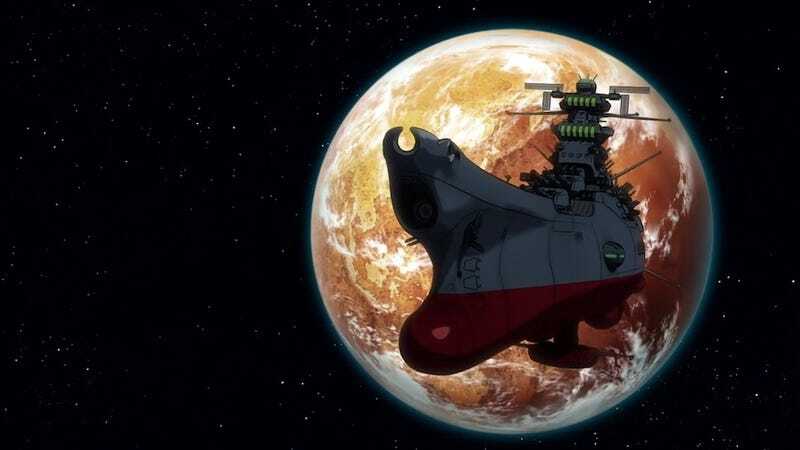 I bring all this up because Space Battleship Yamato 2199 is a modern retelling of that original series, with fantastic animation, a few additional characters, a few new story twists and more. Evangelion’s Hideaki Anno created the opening for it, so if nothing else, you need to watch that (it's above). For more information on all these shows, as well as all the other new anime TV series, be sure to head to Anime News Network.